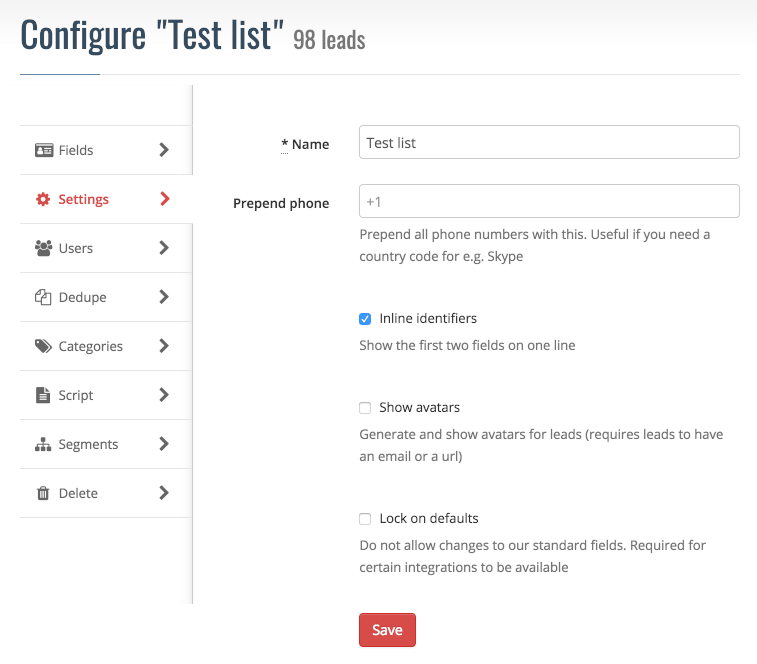 Once you have imported your leads, you are probably ready to start calling the leads in your list, but myphoner offers a few settings, that you sometimes might find handy. Let's walk through the other tabs in the configuration page. Prepend Phone: If you type something in this field, it will be inserted in front of all phone numbers in the list. This can be useful if you want to add a country code to all numbers. Inline Identifiers: Will put the first two fields on one line in the lead information view. This is useful if you for example have 'First Name' and 'Last Name' and want them on one line. Please note that enabling inline identifiers will then turn the first four fields of your list into the identification portion (instead of the first three). Lock on defaults: Lock the default fields and prevent them from being renamed or their type from being changed. This is required for you to sync your list with your CRM or contact manager. It can also be convenient if you just want to make sure fields are consistent across lists for later migrating leads. Available settings for your list. The 'Users' tab is a simple list of users (agents) with checkboxes next to them. Unchecking a user will disallow that user access to the list, and hide it from their interface. Please note that all users has access to the list by default. You can also manage which lists are accessible for a specific user - see Add Users for more information. Pro Tip: Make sure that admins and analysts that are to view reports for this list has access to it. You can limit what users can work a list. All users have access by default. 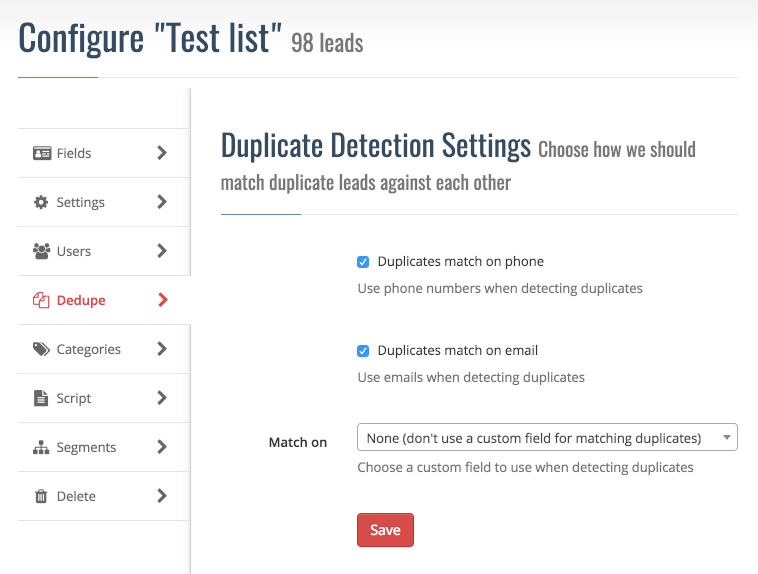 By default, duplicates are matched by phone numbers and email addresses. In the 'Dedupe'-tab you can change this. Let's say you have an additional identifying field, such as 'Full Name', 'ID' or similar. Then you can choose this field in the dropdown for myphoner to start looking for duplicates that match on that field as well. When you change these settings and hit 'Save', myphoner will start looking for duplicates. This can take some time, depending on the size of your list. Usually the detection takes about 5-10 minutes. Pro Tip: Only want to match on mobile phone, not company phone? Simply untick 'Duplicates match on phone' and choose 'Mobile Phone' in the 'Match on'-dropdown. You can change the way duplicates are detected for a list. These are solid, basic states and provides a good foundation for working and handling leads. However, most companies like to analyse the result of a campaign to try and identify places where the next campaign can be optimized. For this purpose, myphoner allows adding custom categories to each state, so that agents can (optionally) choose a category for the appropriate action when finishing a call. The categories can later be analysed in the reports section of myphoner. 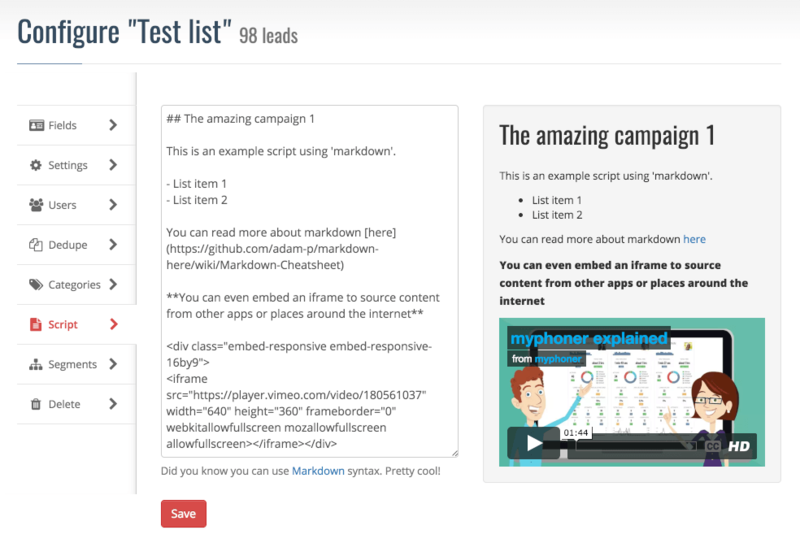 You can also filter by categories when you migrating leads. If you want to configure categories, simply go to the 'Categories' tab on the list configuration page. 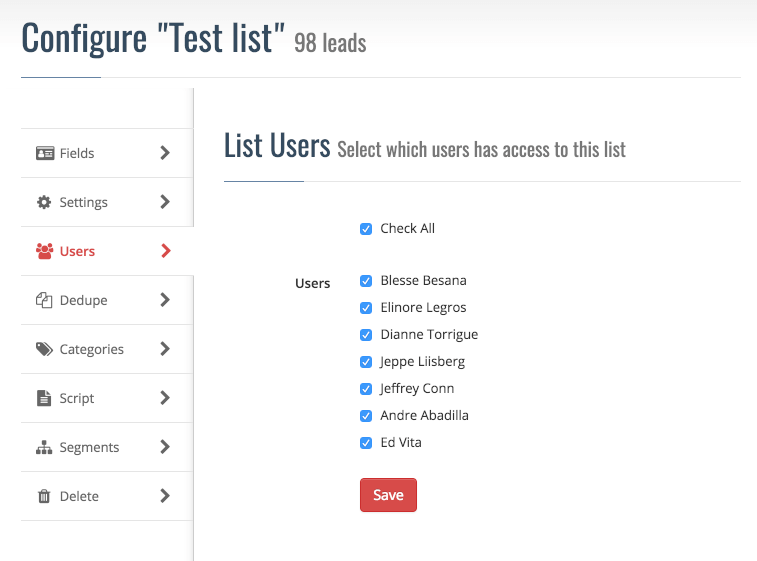 Then input the categories of your choice - separate them with commas - and et voila, you have custom segmentation of your leads. Please Note that categories are stored as simple text strings, and if you make a spelling mistake and later change the name of the category, any leads tagged with the old category will remain tagged with the misspelled version, so be careful with renaming categories in the middle of a campaign. 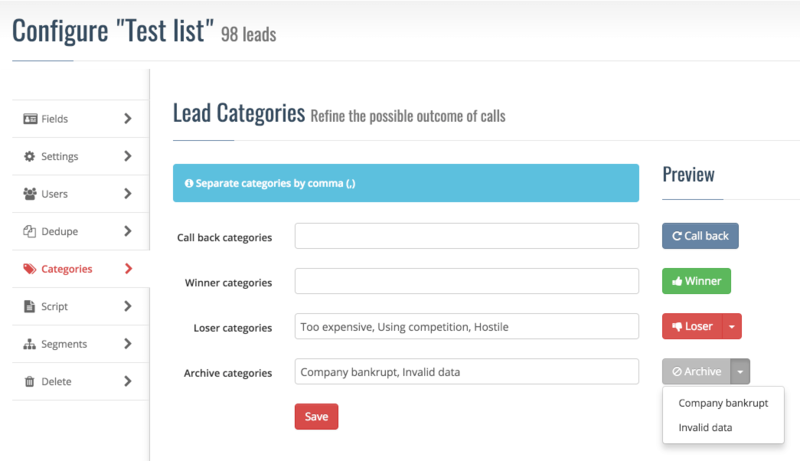 ...and pick the relevant category when calling a lead. Even though we do not recommend reading from a script when cold calling (instead, we recommend practicing your pitch beforehand for a more natural flow), you can create one and make it available to your agents from within myphoner. Adding a script is done from the 'Script'-tab in the list configuration screen. 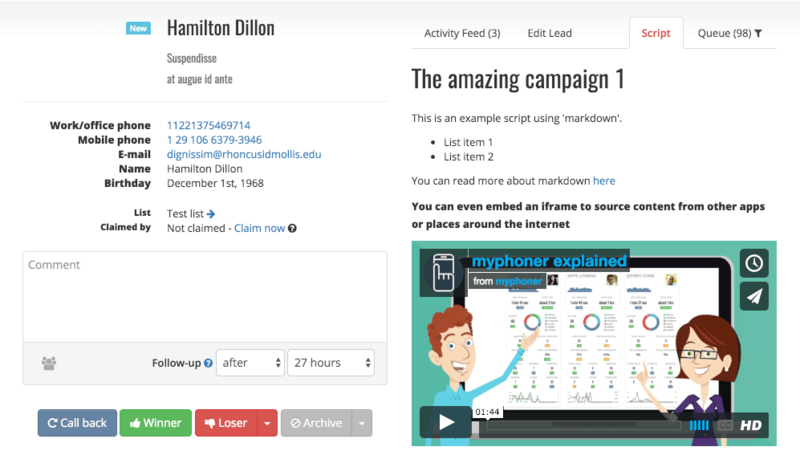 This is an example script using 'markdown'. Read more about the markdown syntax in this Markdown Cheatsheet. When present, the script will appear in a 'Script'-tab when viewing a leads from the list. ...and view it when working your leads.